5 self contained villas perched on the rolling hills overlooking Apollo Bay. Hideaway with your partner in our architect designed villas. Relax in the large therapuetic spa. Snuggle up in the king size bed. Lounge in a fluffy robe. Watch over the harbour from your spacious sun decks. Enjoy our range of specialty teas. While away hours with the selection of books and magazines. Listen to your favourite CD or ours. Treat yourself to an uninterrupted DVD or satellite movie. Feed the Kookaburras and King Parrots from your deck. Thank you so much for a fantastic getaway. So often what you expect is not what you was even better. so many nice touches (flowers etc) that made it even more relaxing and romantic. Rohan and Charlene. We have stayed in many B and Bs in our time, but this was the VERY BEST! David and Julie. We are already looking at our schedule to see when we can come back again. The best place weve ever stayed and we couldn't ask for better hosts. We will be back. You have excelled in every aspect. I have stayed at many places and Point of View impressed me immensly. Luxury apartments such as Crown Towers don't even come close to Point of View. Alan and Glenda designed and built the villas in 2001. They are both locals with extensive knowledge and passion for the area. It's special, secluded and stunning. Saucepans, pans, baking dishes, cooking utensils, crockery and cutlery, snack maker, bowls, chipping boards and bbq utensils. Selection of books and magazines including local alking and bird identiication books. Point of view villas are located on top of a hill with the most incredible view of Apollo bay and the ocean! No photos could do it justice. It’s only a 5 min drive from the Main Street but it gives you the luxury of feeling like you are having a country style getaway but the beach is also just 5 mins away! The villas are so cute and cosey with all your needs and a lovely little fire place. The perfect place to stay all year round. Glenda and Alan are very accommodating and make you feel right at home. They even have everything you need to make your own breakfast in your villa. My husband and I reallh enjoyed our stay, we are sad to leave but we will be back! Cassandra, it was lovely to have you both stay. Photos don't really capture the spectacular view, even though we've tried many times. Tonight for example, the full moon streaming over the ocean was spectacular from the villas. A perfect spot to getaway and relax with the one you love. Point of View Villas are set up just for two, so a relaxing getaway is almost ensured. The full kitchen, BBQ, king bed, robes and double shower along with large spa and special touches such as fresh flowers, handmade soaps and fluffy robes are just some of the features that make the villas self contained. Of course the view is the stand out feature that every guests comments on and is guaranteed to never be the same from one hour to the next. Me and my Girlfriend couldn’t have been happier with our time spent at the Point of View. Great to hear you had a lovely time. The setting of Point of View Villas is definitely spectacular. Each villa has everything you need for a romantic getaway. The views from the balcony (and the spa bath) were simply sensational. Obviously this was part of the reason we booked our stay here (based on the photos) and we weren't disappointed in the slightest. The villa had everything we needed for a very relaxing weekend away. Alan was also exactly the right amount of welcoming and helpful - we felt we could turn to him if needed without feeling like we we being intruded upon. He gave us some great advice and was just a really friendly guy. Thanks Alan - keep up the great work! Shay, thanks for those comments. We love to hear that guests are as amazed by the views as we are still. It doesn't matter what the weather, there is an ever changing vista of rainbows, pink sunsets, storm fronts, sparkling ocean, green hills, twinkling lights from the town,fishing boats returning to the harbour or those spectacular moon rising over the water. We'd love to have you or family or friends stay with us at Point of View in the future. Me and my partner had one of our best holiday there. thanks Alan for your kind attention. We love to hear that guests had a great stay. 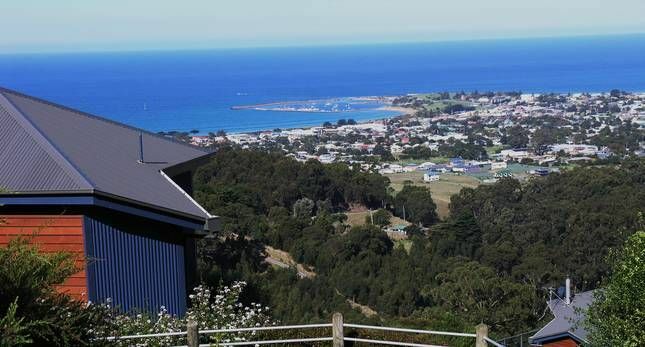 Our villas are in a stunning location overlooking Apollo Bay and harbour. We make sure our villas are spotlessly clean and well maintained. Everything you need for a relaxing stay. As we're both locals, we're able to suggest places to visit and an itinerary to suit each couple depending on their interests. Alan and Glenda are the perfect hosts. Lovely to have you stay at Point of View, Chris. Some of our guests have returned numerous times. They've tried other places for a change and end up back at Point of View for it's views, cleanliness, attention to detail and great hosts!